Barcelona beat Sevilla in the UEFA Super Cup for their first trophy of the season and face them again in the Copa del Rey final. Barcelona boss Luis Enrique insists he will only be satisfied once his side have delivered another La Liga title after equalling a Spanish record by stretching their unbeaten run to 34 games. Barca were forced to come from behind against Sevilla on Sunday as a brilliant Lionel Messi free-kick and Gerard Pique’s winner overcame Vitolo’s early strike for the visitors. Victory restored Barca’s eight-point lead over Atletico Madrid at the top of the table with Real Madrid now 12 points adrift after losing 1-0 to Atletico on Saturday. And it is Madrid’s record of 34 games unbeaten from the 1988-89 season which will fall if Barca avoid defeat at Rayo Vallecano on Thursday. “The record tells me nothing. 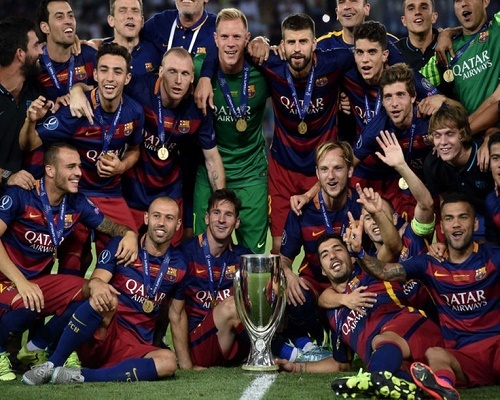 If we win titles then fine, but if not it doesn’t tell me a thing,” said Luis Enrique. “We have wanted to retain the title since the first day of the season. That is the primary objective and we are in better position. Barca have been far from their brilliant best in many of their recent league games with fatigue starting to set in from an already gruelling campaign of 46 games across six competitions. However, Pique highlighted their resolve to put themselves on the brink of a sixth league title in eight years. “We have suffered against Las Palmas, Malaga and other matches, but we have managed to win the games,” said the Spanish international. Sevilla have consistently caused Barca in three games so far this season. The European champions edged a thrilling UEFA Super Cup 5-4 after extra time in their first game of the campaign before Sevilla inflicted Barca’s last defeat in all competitions back in October. “I think they are the opponents who play us best,” added Luis Enrique. The sides will meet for a final time in the Copa del Rey final on May 22 and Sevilla boss Unai Emery admitted Sevilla need to be almost perfect to lift the Cup at the Vicente Calderon. “You have to get the fine details right to get close to them,” he said. “We created chances and defended well when they started to pass the ball, but to beat Barcelona you need a little bit more because we are possibly talking about the best team in the world.